Realistically, you don't know me. I can tell you I helped pull two companies through the dot com crash, and helped build a PLC after it, and it doesn't mean anything. You see where I am now. Not rolling in cash. I need to remind you that is due to ill health and redundancy. It hasn't affected my business sense. I want to help you. The economy will go back down. You need to prepare. When I started saying this, people didn't believe me. They are starting to now. I predicted the recession well ahead of time and took action on those things I could affect. I predicted the dot com bust. I predicted what is coming next. I hope I am wrong, but my track record is pretty good, so I advise you to listen. This is why I set up this blog. Go back to the first posts and listen. I said it there. Things will get worse in the US first, then here in the UK. It will be very hard for the UK, affected by both the US and Europe, and by policy changes. The economy is picking up here but next year will be hard. It will be especially hard for particular groups of people. If you are working in the public sector, start to educate yourself in entrepreneurship now. You'll need that knowledge. You don't know me, but you know of this chap. He's now saying the same as me. Listen to him, and take appropriate action. Take action ahead of time. Don't react. When it happens, I'll put up advice on this blog. Let's hope I'm wrong, and that Tony Robbins is also wrong. Don't fret if we are right. There are always ways round and through these things. That's why I set this blog up. You need to be entrepreneurial to handle this. Be prepared. Get smart. Keep checking back here. When the proverbial hits the fan... keep calm and kick arse! You Think You Know What Motivates You - But Are You Right? The struggle I had getting this idea to be heard in 1999 was phenomenal. Even now, it sounds odd to most. It is true, though - as one look at social media will show you. Guess who is the Most Powerful Woman on Twitter in the UK? Before I found Twitter, my husband was made redundant, and I became too ill to leave the house. I was completely isolated, and living on benefits. It was totally humiliating, and I couldn't afford fuel to go out and network, even if I was well enough. The double whammy of my husband losing his job, and me losing my health - in a recession - sucked. I felt completely trapped. Then I found Twitter. The first thing I noticed about Twitter was how quickly you could build a following - way quicker than a blog. That got me really intrigued. Since then I've worked out how to create mad amounts of influence on twitter - more than A list celebrities even. 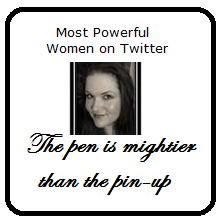 I made it into a list of the 50 most influential women (including superstars and politicians) in the world! That's not a list based on the opinions of one person. That is a list based on the opinions of millions of people, all over the world. The best part is that I now have a readership without needing an agent or publisher so I don't have to give away commission when my books come out. It has given me independence, a network, and friends all over the world. I've gone from being a complete randomer to one of the 100 most influential people on Twitter in my country, without needing to leave my house. All that... and it's cost less than an ad in the Yellow Pages. You want some of that? At the moment, you are part of a tiny little group of people to whom I regularly hand out free training. I plan to do a bit more than that. I want to release an ebook/course about how to get real influence on Twitter. It's not just about follower numbers - I have more influence than people with many times my followers - there's a lot more to it than that. In a little over a year, I've gone from being a complete unknown on Twitter to being the most powerful woman in my country, and the second most influential non celebrity person in my country on that network. I've done it without buying followers or advertising. People might like to know how to do that. What do you think? I'm putting together a Twitter Influence training course, and I want to give extra bonuses to those people who are in the first 50 visible followers on this blog. If you want to know how I've gone from a twitter randomer to one of the most influential women in the world on twitter in only a year, leave your comments below. Once I reach 100 followers on this blog, I will give a special prize to one of my commenters, so tell your friends, and leave comments.